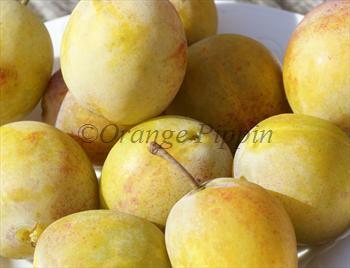 If you are looking for a late-season yellow gage, with the largest possible fruits and sweetest flavour, Jefferson is the one to consider. The fruits ripen in early September, making Jefferson one of the few plums varieties worth considering for a school orchard - since most plums ripen during the holidays. A useful feature of Jefferson is that the plums do not all ripen at once, and picking can take place over a period of about 10 days. This makes it a good plum variety for dessert use because you can pick a bowl-full each evening rather than having to deal with a glut. It is a freestone variety - the stone falls away from the flesh fairly cleanly. One of the best yellow gages. Jefferson is in flowering group 2. Jefferson is self-sterile and needs to be pollinated by another tree of a different variety nearby. 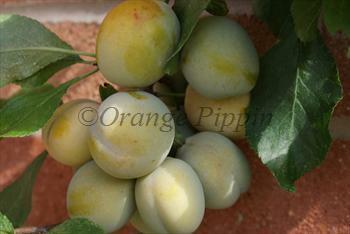 Jefferson is very easy to grow and cropping is good by gage standards, and similar to many plums. The fruit is also larger than most gages. There are two things to note when considering growing Jefferson. Firstly, it must be planted in full sun in order for the fruits to develop their full sweet flavour. A south-facing wall, or a sheltered spot exposed to the south is the best choice. If you can't provide this then it is probably best to choose another variety. Secondly, although it does not over-crop to the extent that some other plum varieties do, it greatly repays thinning of the fruitlets in May if there is a heavy fruit set. Ruthless thinning will allow the remaining fruits to get much larger and develop the best possible flavours. Disease resistance is good - the tree grows strongly and does not seem to suffer from the usual plum diseases. Jefferson is a fairly tough and vigorous tree, and in the first few years can grow at a rapid rate - in good conditions the main shoots of a young Jefferson tree can readily put on more than 1m of growth between April and June. Jefferson is not self-fertile but it can be pollinated by most other common plum varieties including Opal, Oullin's Gage and Victoria. 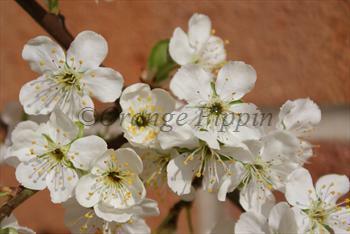 It is also a good pollintor for other early-flowering plums, and it flowers over a longer period than other varieties. All in all, if you have the space for its vigorous growth and can offer it plenty of sun, Jefferson is a great addition to any plum collection. USA 1825. Sometimes known as Jefferson's Gage.